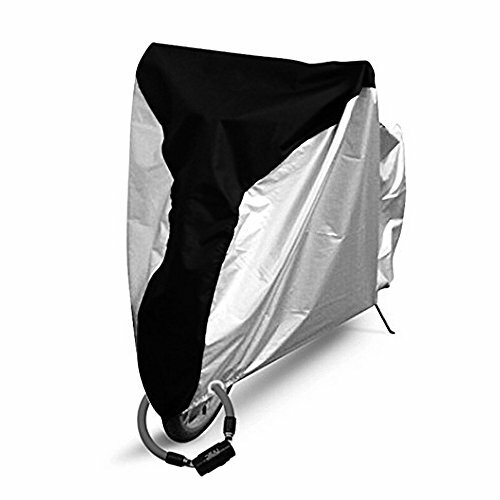 Yougai Waterproof Bicycle Cover will give your traveling equipment the protection it needs when out in the elements. and looks. What once was shiny, now could be rusty. Can you really replace a new bike every other year? Do not. So, this is a way of protecting your bike all year. ▶Durable 210D Fabric Polyester Material: High density and durability, which is much more durable and tear-proof than Nylon material. The silver material is UV-proof 40+. ▶Windproof & Waterproof: it could provide a barrier of rain,dust, sunshine and scratches to bike in outdoors that protects the bike better. ▶Special Design for Lock-hole: With Lock hole design at the front wheels area, specially designed buckle at the bottom stabilizes the cover on top of the bike, keeping it secure on windy days. ▶Warranty: 1 year warranty, 100% satisfaction and zero hassle returns guaranteed.